Design thinking as a human centric approach compliments the AI process when we think about how people's experiences map to data. With AI we are creating a deep learning solution based on the features of data. AI, very much like the people of an organization, succeeds because of a continuous and relentless learning process. We at Liquid Analytics have adapted the foundational Design Thinking process for AI. We call this DTAI™. Design Thinking, a concept popularized by Stanford’s d.school and IDEO, places the vast potential of human creativity inside a highly functional, structured methodology. Design Thinking encourages teams to generate innovative ideas that come to market with low risk, and rapid iterations. Understanding the five stages of Design Thinking is the first step to putting this innovative methodology into practice. When put into practice, Liquid’s Design Thinking for AI optimizes business data and functions with a focus on understanding the human-centered experiences that both created the data and will be driven by the data. DTAI develops intelligent solutions so you disrupt your industry before your competitors. See how the application of Design Thinking based on a broad and wide approach helps you extract the features for your deep learning solution. Empathy is the first step of the Design Thinking process. Empathy is the step that allows us to discover AI opportunities that move the needle and drive specific, measurable discoveries that support the business strategy. Empathy is a deliberate effort to understand people’s thoughts and desires about how they live, work, and thrive. There is incredible business value in examining basic human needs and motivations, and then scaling your products and solutions to meet those needs. This stage involves observing, engaging and listening to real people through qualitative research that gathers ethnographic data. It allows business leaders to set aside their own biases about the world and make decisions based on a data-backed observations and an understanding of their customer experiences, motivations, and needs. This stage often gets to the heart of understanding the true opportunity and not just that which has been stated or predetermined by others. During this stage we collectively learn the customer’s domain, the language of the domain and the data that represents the domain. We help the organization understand that just like onboarding a new employee, AI only succeeds with the assistance and nurturing of the organization and that AI is a learning process that gets better over time. As with any user research or data gathering project, the first step of AI is to review the vast amount of data, which may or may not be structured and organized and be open to unknown and novel insights that will transform your business. Without empathy we will miss features and constrain our solution to only providing solutions we expect. During the define stage, your team analyzes and synthesizes all the information you gathered during the empathy stage, as data, in order to define a core problem that needs to be addressed. Through asking cross-functional, human-focused questions, Design Thinkers try to work toward a point-of-view statement, or a problem statement, that not only identifies a problem, but also frames it in a way that invites creative, multi-layered solutions. With DTAI we describe the problem in context of data. Your company is defined by its data. Without data companies cannot learn. You are your data! With AI projects this is where we ask “show me the data”. The wish of every data scientist is: “I want labelled data”. Define starts with an organization’s current data. The hardest part of AI is getting to clean data. (Tip: Liquid Analytics provides a set of data templates and open APIs to help accelerate your ability to realize an AI solution). Once we have clean data we will extract features, based on your domain knowledge. One of the most important aspects of AI is Featuring Engineering. An organization’s best kept secret is the optimization that comes from knowing the features of your business domain! Now that you’ve empathized with your customers and their needs to identify a human-centered problem, you are ready to begin brainstorming innovative and disruptive solutions to that problem. This phase is all about quantity, not quality. The more ideas you can generate, the better. It’s not about coming up with one perfect solution, it’s about addressing your problem from all angles and trying to think of as many cross-functional solutions as possible. An effective question to ask during this phase is “What if...?” to help initiate the creative process. And remember, although designers create products in direct response to their customers’ needs and desires, you shouldn’t be afraid to bring your own disruptive vision and expertise to the market. When appropriate, business leaders must be willing to put long-term business value ahead of short-term turnover when formulating innovative solutions. Practically speaking, there are many factors that will go into correctly selecting your first AI project. While constraints are necessary for selection, we should not use these constraints to stop us from thinking about ideas that can transform your business. After all, it is your goal to disrupt your industry and not have your competitor initiate the disruption. This disruption will come from the AI generated insights you don’t know about. Once you’ve generated an ample pool of ideas, you need a systematic way to narrow down your list. Prototyping, is testing individual aspects of your AI solutions with your users and stakeholders. Prototyping is a low cost and quick way to test if something will be adopted. In many cases AI prototyping is accomplished via visual reports, UX mockups, paper-prototypes, reports and flowcharts. To do this, the Design team will produce a number of inexpensive, scaled down versions of the products or features identified during the Ideate phase. This is a highly experimental phase that allows Designers and teams to explore details related to individual solutions. By the end of the prototyping, the team will have a better idea of the underlying constraints, and how actual users will interact with the different solutions. As part of Prototyping we strongly advise you perform A/B testing or some other form of user feedback testing. You want an initial set of users to test your prototype and provide feedback. Prototyping reduces rework in the Test phase by allowing stakeholders and users to approve designs prior to the development process. Once you’ve targeted and obtained approval for your AI solutions in the prototyping phase, it’s time to commit resources to realize and build your product. We call this version a Minimum Viable Product, or MVP. 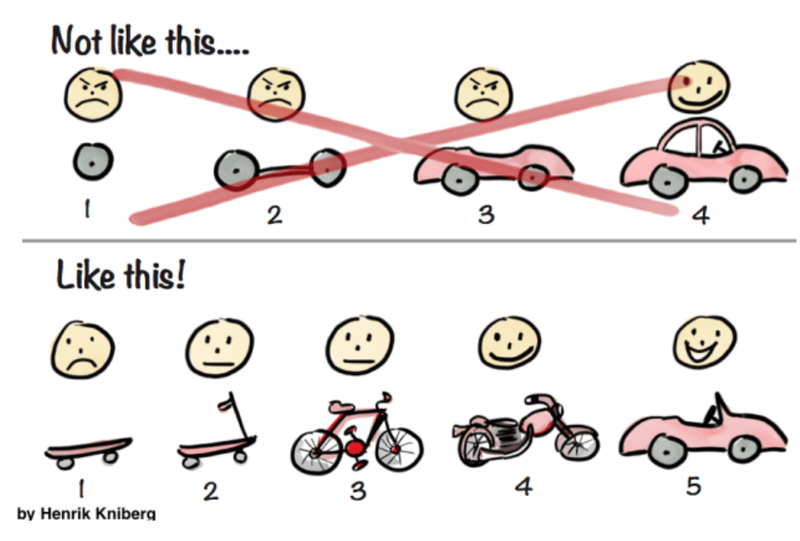 MVP has its origins in Lean Agile development. An MVP is the minimum set of features to engage your customers. An MVP starts the entire feedback and learning process. Although it is tempting, we never want to over-engineer or scope creep the MVP. We want to release and ship quickly so that we get feedback and refine our training process. The decision makers and stakeholders of your project must be convinced about the viability, desirability and feasibility of the product. You want usability feedback so you can enhance and evolve your product. You want to minimize development costs, especially upfront costs of spending too much when you have too many unknowns. You want to fail fast. A failed MVP means you have learned what doesn’t work without spending millions of dollars, and can now build a better solution in the next iteration. You want your product to be always usable even if the product does not have all the features. Henrick Kniberg does a great job to illustrate the thought process behind an MVP. During this phase, refinements and adjustments are made, tested and then refined again, in order to derive as functional and human-centered a product as possible. But remember, Design Thinking and AI are not destinations, they are a process. The results generated in the Test phase are often used to identify and redefine other problems, and create new avenues for continued growth. As part of Liquid’s DTAI, the Test phase is where you as an organization learn the details of creating your first AI MVP. Please see the report “The Stages of an AI MVP” for more information as to what is necessary to build your AI MVP solution. Design Thinking is a human-centered approach to problem-solving. As we move in to a more AI and automated driven world, it is critical to create an organizational culture that embraces rapid prototyping and data-training in order to bring innovation to market. Businesses must scale their teams to prioritize both human-centered experiences and highly disruptive AI-driven products. For personalized insights on how to implement Design Thinking practices, targeted for AI projects, into your organization, contact Liquid Analytics for a free consultation. Lyn Nguyen is the CEO of Liquid Analytics. She leverages machine learning and design thinking to drive innovative change for enterprise clients. Connect with her on LinkedIn.